NUS Geog Soc: Dinner and Dance 2013! · Registration period ends on 23rd August 2013. · Payment and collection of tickets in Week 2. · Registration period ends on 20th August 2013. · Payment details will be sent via email upon registration. *Sign up in groups of 5 to get a 10% discount off ticket prices. So what are you waiting for? Register NOW at http://bit.ly/geogdnd13 ! For further enquiries, contact Eliza Ho at 91504309 or Jocelyn Ng at 9722 5956. 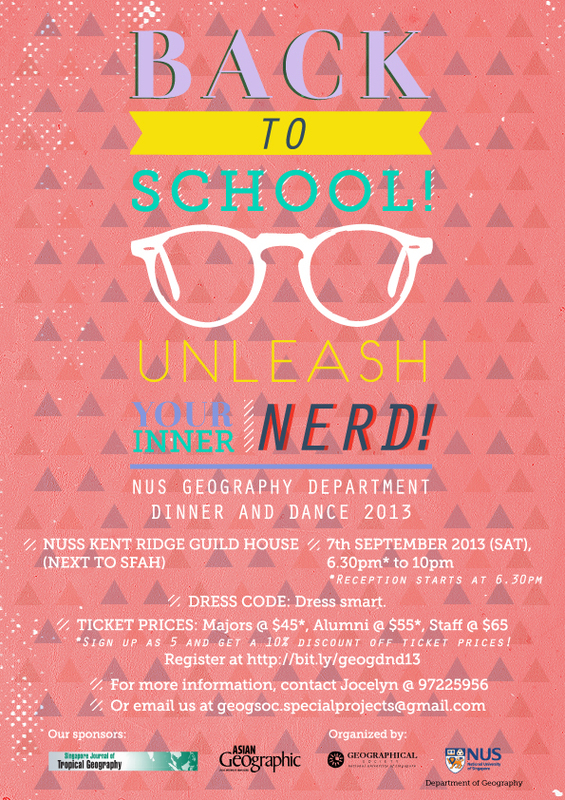 Alternatively, you may email us at geogsoc.specialprojects@gmail.com .